The all-new RF-1200 comes equipped with a Pinlock® Fog-Resistant System, offering the most effective anti-fog protection in existence. A simple, one-step installation process makes every Pinlock® lens easy to install. Few characteristics of a motorcycle helmet are as critical as its first-layer defense, which is precisely why the new RF-1200 features the SHOEI-exclusive Multi-Ply Matrix AIM+ Shell construction. Combining fiberglass with organic fibers, the RF-1200’s proprietary AIM+ Shell is not only incredibly strong, it is extremely lightweight and compact. The RF-1200 is Snell M2010 and DOT approved. 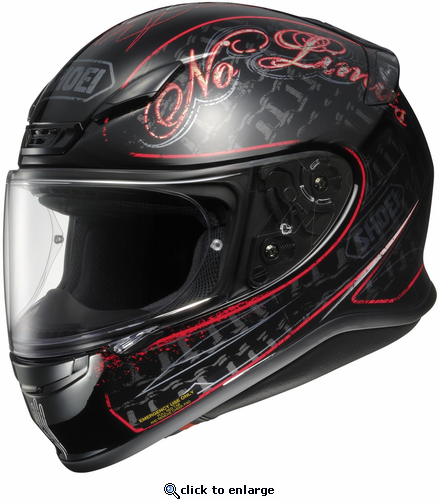 While some of our competitors rely on foam padding for fitting a wide range of customers, SHOEI offers an industry-leading four shell sizes in the RF-1200 to ensure a custom fit for heads between the sizes of XS-XXL. Borrowing technology developed for SHOEI’s groundbreaking VFX-W and X-Twelve racing helmets, SHOEI equipped the RF-1200 with its exclusive Emergency Quick Release System that allows emergency medical personnel to easily remove the cheek pads from an injured rider’s helmet. With the cheek pads removed, the helmet can be safely lifted from a rider’s head without creating unnecessary strain in the neck area. The RF-1200 is equipped with a fully removable, washable, adjustable, and replaceable 3D Max-Dry System II interior. The 3D center pad components are three-dimensionally shaped to match the contours of a rider’s head, allowing for an extremely comfortable fit while maintaining the firm hold necessary for distraction-free, high-speed riding. Additionally, the RF-1200’s 3D-shaped cheek pads are available in multiple thicknesses for a customizable fit, and SHOEI’s exclusive Max-Dry System II liner material absorbs and dissipates sweat and moisture twice as fast as traditional Nylon interiors. The RF-1200’s Dual-Layer, Multi-Density EPS liner not only provides enhanced impact absorption by utilizing varying densities of foam in key areas around the rider’s head, it is designed to allow cooling air to travel unrestricted through tunnels created in the EPS, further enhancing the RF-1200’s superior ventilation characteristics. In addition to enhanced impact absorption and ventilation, the precise placement of multi-density EPS liner material yields a more compact, lightweight design. The RF-1200 is equipped with removable ear pads.